I wish I didn’t have to expect it. I try to be an optimist and hope that when I enter the door I won’t have to engage in a battle. But 9 out of 10 times this happens when we arrive at a hotel. This past weekend in Richmond the same old scenario occurred. We had to battle and negotiate over our incorrect room reservation. I thought I had tried every means possible to ensure that our reservation is accurate when we arrive at our destination. 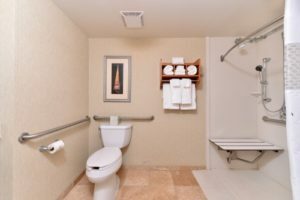 When I call and make the reservation I explain to the agent in as many different ways as possible that we need a wheelchair accessible room with a roll in shower and a room adjacent/or very close for my attendant so I can call for help with my call bell. I request that a notation be put in the comments section of the reservation. I get the name of the individual who takes the reservation. And, if I’ve had success at a particular hotel, I ask for the exact same rooms by number. But for some reason, this still does not work. Each time I add additional “must” information to my list. But why should it have to be so hard to get a correct reservation? It is not like I am asking for a free room. I am paying the rate that everyone else pays. And when we arrive, just like other customers, we may be tired or need to quickly freshen up and get to another commitment. We usually don’t have time or energy to spend moving from room to room and/or negotiating with the individual at the desk about the problems with the reservation. This time, our wheelchair accessible room was not listed. Luckily there was another wheelchair accessible room available. First breath of relief. The second issue was the “adjacent” room was far from adjacent. We were in room 401 and the “adjacent” room was 414, located as far away as you could get on the same floor, at the opposite end of the hallway. I was told that no other rooms next to 401 were available. I was informed by the manager on site that to get the adjacent room, even though it was written in the comments, I would need to call the day before and the day of arrival to ensure that the person doing the allotment of rooms made the appropriate designation. Really? In my frustration, I requested extra hotel points, complementary parking, and compensation for the room that was all the way down the hall. It was so far that my call bell did not work when I needed my attendant during the night. Thankfully, it was not a life-threatening need, but it could be next time. I was given the points and complementary parking, but was told that the manager on duty could not take the second room off the bill and that to do that I would have to contact the district manager. I plan to do so. So now what? Even though I told them I had another reservation for December and I would change it if I was not appropriately compensated, it didn’t seem to make a difference. I felt like they wanted me to go somewhere else so they didn’t have to deal with the problem. 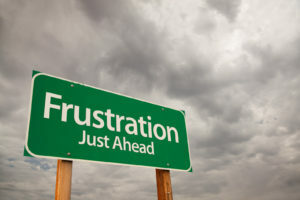 The frustration is so over the top that it really makes you think twice about traveling because of the effort and discomfort. But Tony and I have decided that we will not let them beat us! My new approach, revised again after this experience, is to make a reservation and have them put everything in the comments. Get the name of the individual who takes the reservation. Call one week before to ensure the reservation is accurate. Call again the day before to make sure the second room is adjacent. And call again the day we check in to double check everything. Will it work? We shall see. In the meantime, I will start my efforts getting compensation for room 414. And so it goes. I will keep you updated in future blogs.